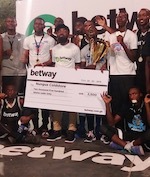 Defending Accra Basketball League (ABL) Men's Division I Champions Braves of Customs have clinched a 66-41 win over Tema Youth in the division's biggest clash. The game stands out in Round 8 of the 2018 season with all four games to be played at the Prisons Court in Cantonments. On late Friday June 1, Braves won the first of two regular season games against its arch rival. 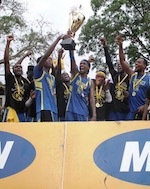 The game took place after Tudu Magic beat Adenta Leopards 63-55 in the preceding game; the win was a shock considering Leopards were on a four game winning streaking heading to the contest while Magic had blown a ten point lead in the final quarter to lose 55-56 to Tema Youth in Week 7. Braves were quick out of the blocks and peppered Tema to the tune of a 32-13 lead heading to the third quarter as a beautiful alley oop connection by Forward Enoch Borsah was the best Youth could muster through the opening half. Customs continued to pile on points stretching its lead to 42-17 with little over five minutes left to play in the third quarter before Youth threatened to get back in the game with a seven point run. However, Braves Shooting Guard Baniba Dodzie scored two free throws and added a three point shot to setup his side for the win. Ghana Police takes on Ghana Fire Service and Navy Warriors play DC Dynamics in the second phase of games of the round.